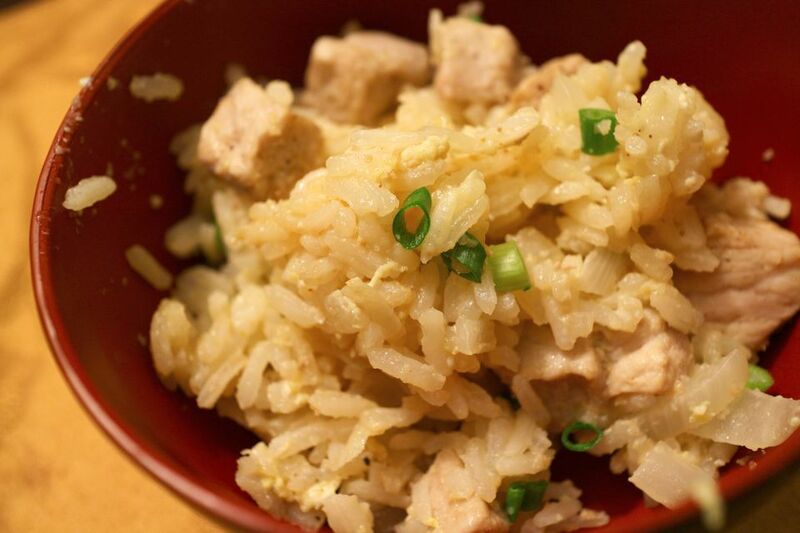 Char Siu barbecued pork is a great choice for fried rice dishes. Makes 4 to 6 servings. Beat the eggs with a little salt in a small bowl. Heat 2 tablespoons of oil in the wok over medium heat 1 minute. Pour in the beaten eggs, stir until eggs are cooked dry and separated into small pieces. Remove eggs from the wok and set aside. Clean the wok out, then heat 3 Tbsp oil in wok over medium heat 1 minute. Add the rice and green onion, stir-fry 5 minutes. Add the peas and pork, stir-fry for another minute. Add chicken broth, soy sauce, and stir to mix well. Stir in the eggs and sesame oil and stir well. Remove from the wok and serve hot. This recipe was submitted by Ron.